The Minganie region in Côte-Nord is definitely worth the detour. All visitors will find something to delight them in this pristine territory that charms with its vast forest and soothing silence. You will be struck by the wild beauty of this still little-known corner of the world, where water surrounds you: rivers, lakes, waterfalls (including the Manitou Falls), not to mention the St. Lawrence, which is as wide as a sea—you will feel like an explorer in a new world. From Rivière-au-Tonnerre all the way to Natashquan via Havre-Saint-Pierre and the stunning Mingan Archipelago, Minganie offers 360 km (220 mi.) of coastline for you to discover. Breathtaking scenery is one of the main draws of this remote region blessed by nature. 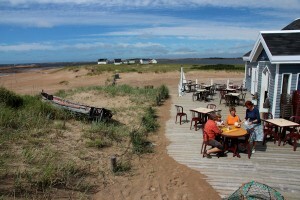 Perched on a rocky shoreline, Rivière-au-Tonnerre is considered one of Côte-Nord’s most picturesque villages and is thus a good introduction to the Minganie region. Once the crab capital of the world, this municipality of fewer than 400 people is home to spectacular waterfalls (accessible via hiking trails). This is a perfect place to relax and reflect—take a stroll along the shoreline or on the ageless rocks to clear your mind and connect with nature. Be sure to visit the Rivière-au-Tonnerre church, which was built in the Norman style. You will be charmed by its pastel interior as well as the nearly 60 motifs that were hand-carved by pocket knife. Part of Québec’s religious heritage, this wooden “semi-cathedral” was built by the townspeople in seven years in the early 20th century. The Maison de la Chicoutai (Cloudberry House) is also worth a visit. Bruno Duguay will introduce you to this tart Côte-Nord berry, which is difficult to pick but is made into so many delicious local products (jams, butter, teas, liqueurs, etc.). Listen to the silence in the Mingan Archipelago National Park Reserve, which is accessible from the Acadian town of Havre-Saint-Pierre (or Longue-Pointe-de-Mingan). This unique string of islands and islets has been part of Parks Canada’s network of protected areas since 1984. Several of the islands welcome hikers and wilderness campers. Of these, Quarry Island is not to be missed: explore several different ecosystems via wooden boardwalks that take you across the island from south to north. On your own or accompanied by a Parks Canada guide, you will discover the island’s astonishing flora, including many lichen (an indicator of pure air). Home to over 400 species of vascular plants, Quarry Island is even more ecologically diverse than the coastline. To complete your adventure, head to Natashquan (which means “where we hunt bear” in the Innu language) at the end of Route 138. You’ll need at least a whole morning to discover the secrets and treasures of this village located in Innu territory, which is also the birthplace of famous Québec poet and singer/songwriter Gilles Vigneault. 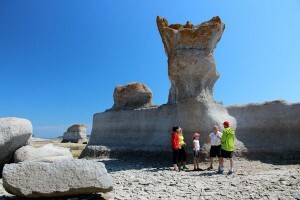 A land of legends, music and poetry, this municipality at the edge of the world is renowned for the Innucadie Stories and Legends Festival, which takes place in July. 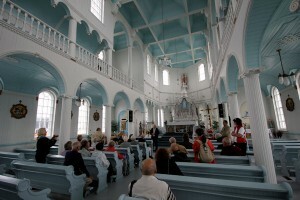 To learn more about local history, visit Les Galets, former fishing warehouses that became a heritage site in 2005; the church, one of the oldest in Côte-Nord, which was built from two shipwrecked boats; and the Vieille École, an old school, which has been restored and turned into a museum dedicated to Gilles Vigneault. Be sure to also stop in at the Copacte Natashquan tourism office for information about what’s going on in the village during your stay. Day 2 (PM): End your stay with a swim! While the St. Lawrence is known for its cold waters in the summer, Natashquan is an exception. You can enjoy a swim in the warm shallow waters of the bay, where two rivers meet: Grande Natashquan and Petite Natashquan. This is also the perfect opportunity to stop for a bite to eat at Café L’Échouerie, where you can soak up the stunning view of the beach and the blue sea and sky. This village hub bustles with activity and entertainment—and is yet another reason you will find it hard to leave this beautiful corner of the world!